What Can The Web Do For You Today? The Droid 3 will be out on Thursday. This is a phone that I have been waiting for ever since I got my Droid X some time ago. I really liked the X mostly for it’s size and screen, but what it really lacked is the slide out keyboard. So now I am off to grab the new Droid 3 as soon as I can. So with that I am on a mission to find the accessories for the Droid 3 without paying the crazy Verizon store prices! 1.) The Droid 3 Car Dock. 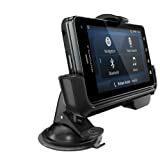 This is the most important accessory for me as I drive a ton and love having the Droid always accessible in it’s spot. Looks like they updated the design of the car dock. The dock for the X had a longer arm from the suction cup to the phone itself. This made the phone bounce a little on the bumpy roads. Looks like they updated to make it more stable, and it just plain looks cool too! This package said it contains a custom audio and power USB cable? Does this mean that it will grab the audio thru the USB so you don’t have to fiddle with hooking the audo cable into the phone after it is docked? Wow that would be great! I have been wishing for this feature for a while. I’ll let you know if this is true as soon as I get one in my hands. UPDATE: I just got my Droid 3 Car Dock, and Yes, the audio gets pumped thru a special USB cable that has an audio jack on the end. So all you have to do is put the phone in the dock and you are ready to go. No more searching for the audio cable and hooking it into the audio jack on the phone! Nice Job Motorola! 2.) 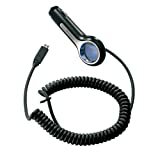 Droid 3 Car Charger. Just about any Droid car charger will work for this phone, and if you buy the car kit above it comes with the charger. So for those who do not have this yet, here is a link to get this cheap. 3.) Droid 3 Multimedia Station. I really liked the multimedia station for my Droid X as it gave the phone a nice ‘home’ while charging or sitting on the bedstand. Like the X, this station includes an HDMI port thru that will allow you to hookup to your HD TV and mirror the output of the phone on the TV. 4.) Bluetooth Wireless Headset. This is a universal accessory that is really nice, especially in those states where using the phone while driving is illegal. I like the Motorola brand Bluetooth headset because the have special ‘hooks’ into the phone that will give you added features like reading your text and emails. I also like it because it has a neat flip open type of door that shuts the unit off when you don’t want to use it. That keeps the battery going for a long time cause you never forget that you left it on! These are my ‘Must Have’ accessories list for the new Droid 3. I am excited to pick up this new phone and I will be back with my first thoughts on the Droid in a few days! What about you? What kind of accessories are your ‘Must Haves’? Let me know in the comments below. Hey, will the DVD to Droid work for this phone too? Sweet program btw. Man that would be sweet if the Car dock had pass thru audio. I use the plantronics bluetooth headset and that one works really well. I got the droid 3 dock today, and it does indeed send the audio through the micro-usb. connecting the usb is part of putting the phone into the dock now. so all you have to do is drop the phone in and you have power and audio already connected. the dock also has a spacer to allow for people who want to use a case to use the dock also. the only thing that is really a negative is you can’t open the slider unless you don’t clamp the top clamp down. however, with the spacer in place, the phone is actually pretty secure so I prob won’t be clamping it all the time. Tips, Tricks and Secrets to make the most money from any blog! Sign up for our newsletter below for Instant Access! Wii Disney Just Dance – What Does Dad Think? Look-alike Dragonvale Costumes – Scary and Fun!